Jeffrey Ganek is CEO of Ganek Ventures, an early stage venture developer and investor. He was Founder, Chairman and CEO of Neustar from 1995 through 2010. He led the company that manages all the telephone numbers and the directory that is essential to the routing and delivery of all calls in North America. Additionally, Neustar managed the routing of more than 20 percent of the traffic on the internet. Ganek founded Neustar as an independent unit within Lockheed Martin and led a management buy-out in 1999. Neustar has been a public company since 2005. Ganek is also Chairman of INTTRA, the largest multi-carrier e-commerce services provider for the global shipping of cargo containers. He is Chairman of The Wireless Registry, which is building the registry infrastructure for the Internet of Things. 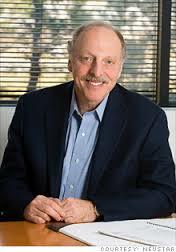 He has served on the board of comScore, the source of digital audience measurement. From 1991 - 1995, Ganek was the Senior Vice President - Operations at Global TeleSystems Group, a developer and operator of communications service companies in China, India and Europe. He led marketing and corporate development initiatives at MCI from 1985 - 1991. Previously he was at AT&T. Ganek was designated Entrepreneur of the Year by Ernst & Young in the Washington, DC Region. He is a member of the Advisory Boards of the Heinz College at Carnegie-Mellon University and the Kogod School of Business at American University. He earned an M.S. in Public Policy and Management and a B.S. in Economics from Carnegie-Mellon. He is married with two wonderful children.